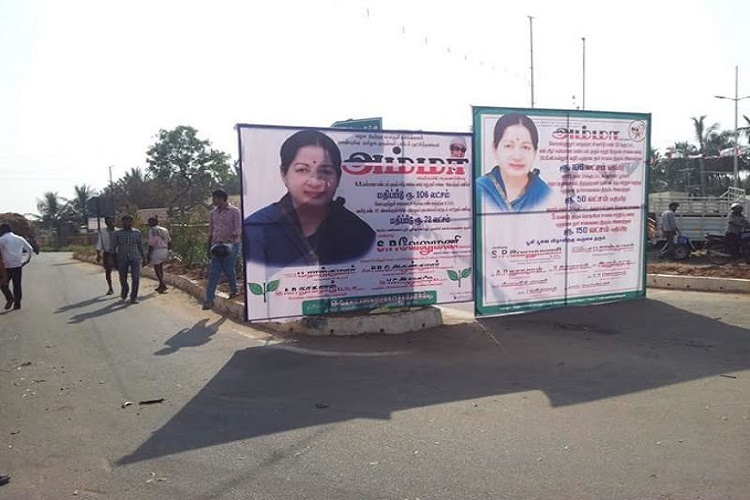 Ahead of Former Chief Minister and AIADMK supremo Jayalalithaa’s birth anniversary, the Madras High Court on Wednesday refused to relax its ban on registered political parties installing flex boards, digital banners or placards on arterial roads in or any other roads in the State. A Division Bench comprising of Justices M Sathyanarayanan and M Nirmal Kumar rejected the petition filed by N Balaganga who is part of the AIADMK. The party worker’s petition requested the court to relax the December 19 ban and allow him to erect flex boards of Jayalalithaa across Chennai city between February 22 to 26 to commemorate her birth anniversary, according to reports. Refusing to relax the ban, the Bench stated that there was a need to uphold the majesty of the law. Stating that no relaxation of the flex board ban would be done, the court stated that there had been several violations of court orders against flex boards by different courts in the past 6 years. In a response to a senior counsel who argued that authorities had now been taking action against those who violated the law, justice Sathyanarayana said that they have only been reporting about action taken after such flex boards were erected. But prevention of such incidents is also needed. On December 19, the Madras High Court’s Division Bench had ordered that recognised and registered political parties should not erect flex boards and banners until State government and the local municipality agree to following the Tamil Nadu urban local bodies (permission for election of digital banners and placards) Rule 2011 is followed. Further the Bench also stated that ‘no worthwhile details’ had been provided in the affidavit submitted by Municipal Administration Secretary Harminder Singh on the protection of those who violated the rule. It ordered Harminder Singh to file an affidavit detailing the prosecution the same by March 13.